I’m a big lover of online movie and music steaming and that’s why published lots of articles for music and movies streaming online as well as downloading. And as I published those articles, I was really surprised on getting a huge hits because of people’s craze for movies and music. 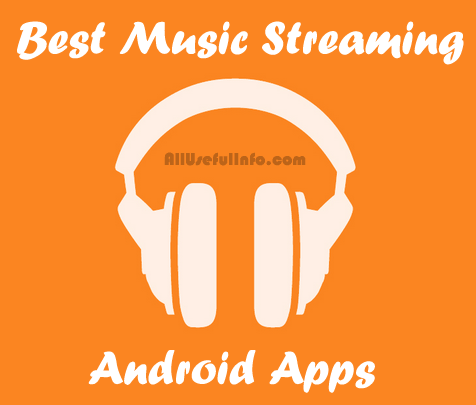 As previously I’ve provided the list of best websites for online music streaming, today I’m going to showcase the popular and worth having Android apps for online music streaming. I’ve also listed Android apps for music composition and music player for your phone that you will like to install in your device. Now, get ready to install a best Android app in your phone or tablet for listen to your favorite music online without downloading (however some of these apps also lets you download songs). Gaana is a free and most popular Android app for online music streaming, brought to you by India’s largest online music broadcasting service – Gaana.com. It gives you free and unlimited access to all your favorite Songs, Bollywood Music, Radio Mirchi & Music videos on your mobile phone. This Gaana Android app not only gives you access to Bollywood or Hindi songs but also you can enjoy millions of Tamil, Telugu, Marathi, Kannada, Punjabi, Malayalam, Bhojpuri, Rajasthani, Bengali, Assamese, Oriya & English Songs for absolutely free. Savan is another free and popular music streaming Android app, that gives you unlimited access to all your favorite Bollywood, Indian regional, and English music wherever you go. With this Savan app, you can create your own playlists of your favorite songs and artists. Savan lets you stream music online from the newest to old classics including bhangra, bhajans, ghazals, pop, remixes, and more. Saavn’s catalog includes millions of tracks across Hindi, English, Tamil, Telugu, Punjabi, Marathi, Bengali, Kannada, Gujarati, Malayalam, and Bhojpuri. Hungama Music is a free music streaming and downloading app for Android holders. It gives the unlimited access to 2.5 million+ Hi-Definition Songs and Music Videos. Hungama music has a broad collection of Bollywood, Pop, Rock, Bhangra, Devotional, Bhajans, Happy, Sad, Romantic, Party, Love & Old songs. You can also stream music regionally like Punjabi, Bhojpuri, Marathi, Bengali, Kannada, Gujarati, Tamil, Telugu, Malayalam & other South Indian languages along with Ghazals and the best of English music. Spotify Music is an Android app of the world’s popular commercial music streaming service “Spotify.com” which is headquartered in London, United Kingdom and Stockholm, Sweden. Spotify Music app is free though, but you can go for its premium version that extends some features like no ads etc. With this Spotify Music app, you can easily listen to artists and albums, or create your own playlist of your favorite songs according to your mood. Wynk Music is absolutely free and the best music streaming Android app. From Rahman to Rihanna it has over 1.8 million songs across Indian and International music. It is ad free music streaming app lets you stream as well as download songs by genres, moods, artists or simply tune into one of the many Radio channels. It contains the greatest hits of Bollywood, English, Indipop, Tamil, Telugu, Kannada, Bhojpuri, Punjabi, Bengali, Malayalam, Gujarati, Marathi & Rajasthani songs. Gaana and Savan both are the best online music listening apps.